In this Wednesday, Dec. 5, 2012, photo, a Honda Accord is for sale at a Honda car dealership in Des Plaines, Ill. A new AAA study published Wednesday reveals the true cost of owing and operating a new vehicle in 2017. The costs of owning and operating a brand new car in the United States can cost on average $8,469 annually, or $706 a month, according to a new study from the American Automobile Association. 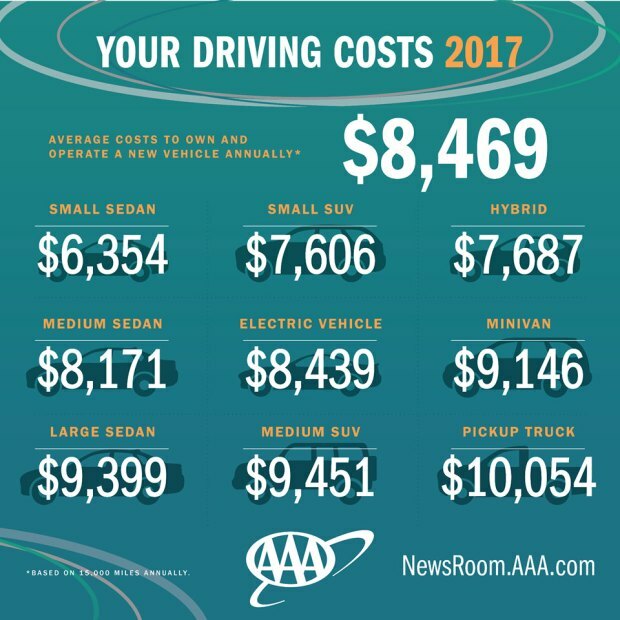 AAA's Your Driving Costs study, which analyzes ownership costs for sedans, SUVs and minivans, added four new vehicle types in the 2017 report – small SUVs, pickup trucks, hybrids and electric vehicles. The study concluded small sedans are the least expensive carrs to own at $6,354 annually and pickup trucks are the most expensive vehicles to drive at $10,054 a year. Small SUVs averaged $7,606 a year, while hybrids cost about $7,687 annually. "Determining the cost of a new vehicle car is more than calculating a monthly payment," said John Nielsen, AAA’s managing director of Automotive Engineering and Repair. "While sales price is certainly a factor, depreciation, maintenance, repair and fuel costs should be equally important considerations for anyone in the market for a new vehicle." AAA evaluated 45 2017 model-year vehicles across nine categories and found the average cost of annual maintenance was $1,186 and new vehicles lose an average of $15,000 in value during the first five years of ownership. The study also revealed electric vehicles are cheaper than conventional cars to maintain, but they're more expensive upfront and lose value at a much faster pace over time. Electric vehicles have lower-than-average driving costs at $8,439 per year. Without a gasoline engine to maintain, maintenance costs averaged at $982 per year and fuel costs were under 4 cents per mile, compared with 10 cents per mile — $1,500 a year — for the average new vehicle. However, depreciation was extremely high averaging at nearly $6,000 in value every year. "Although electric vehicles can have higher upfront costs, lower fuel and maintenance costs make them a surprisingly affordable choice in the long run,"said Nielsen. "For even lower costs, car shoppers can avoid high depreciation costs by selecting a used electric vehicle."